Europe is falling behind Asia in terms of education and skills, a report published by the Brussels-based Lisbon Council think-tank says. China and India, on the other hand, are starting to deliver "high skills at low costs and at an ever increasing pace". South Korea and Finland are highlighted as positive examples where investment in education has taken priority. The report's author, Andreas Schleicher from the Organisation for Economic Co-operation and Development (OECD), says the solution is clear for countries falling behind, like France and Germany - investment in education and skills. "Education and skills will be key for Europe to achieve its ambitious goals," he says. "In short, if Europe wants to retain its competitive edge at the top of the global-value-added chain, the education system must be made more flexible, more effective and more easily accessible to a wider range of people." He adds that France and Germany, "which make up 35% of the European Union's 11.6 trillion euro economy, are no longer among the world's leaders in developing knowledge and skills". Mr Schleicher praises the "miracle" of South Korea - a country which in the 1960s had a lower national income than Mexico and South American countries and sat near the bottom of the 30 OECD countries in terms of educational qualifications. 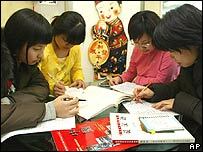 Today, 97% of South Korea's 25 to 34-year-olds have high school education - the highest rate among the main industrialised countries. He says South Korea was transformed by its positive response to a demand for education. "When demand for education began to outpace supply, students were not sent home," he said. "Instead, class size and schooling hours were extended." Parents also invested in private tuition for their children. "The incentives driving these reforms forward was a plethora of merit-based learning opportunities where progress depended on what children were able to do, not where they came from." Mr Schleicher says this differs from France, Germany and Italy, where class distinction is a cause for concern. "Europeans from difficult socio-economic backgrounds don't receive the same educational opportunities as children from rich and middle-class families," the study said. "In many countries, the data suggest that European schools reinforce existing socio-economic inequities." In Germany, for example, children in white-collar families are four times more likely to go on to higher education. He says educators in Europe are also reluctant to change their ways, despite research. "Education in Europe continues as a cottage industry, with practitioners working in isolation and building their practice on folk wisdom about what works," he says. ensuring universities are governed by a wider range of stakeholders than the academic community.